Engaging Individuals, Small groups and the larger Group. Learn as much as we can about your institution, its mission and goals. Note and notice the parameters and constraints that affect implementation of your educational programs. Find and understand the meaningful interesting math concepts that relate to your program. Offer suggestions, ideas, materials, models, and even teacher facilitators for on site events so that your visitors have a good experience with the math, and an enhanced appreciation for your exhibit. 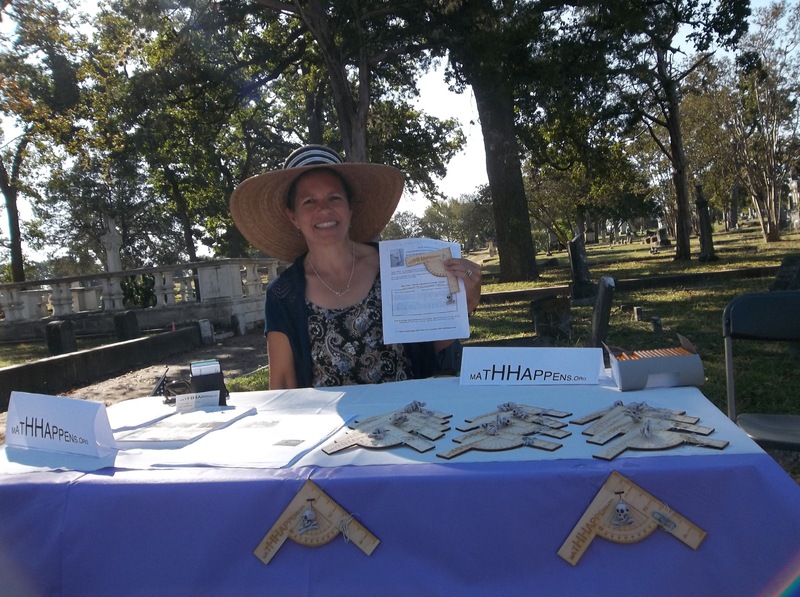 What we learned: Cemeteries are full of numbers, dates, and all kinds of connections to the actuarial sciences. They also offer poetry, history, and a personal connection to the past. At this place, the focus of the conservators is preservation, conservation and respectful fundraising to address the tilting of the monuments caused by unstable soil, tree roots and simply age. MathHappens: We designed a plumbline with degree angles in a skull and crossbones motif to coordinate with an October fundraiser. We gave visitors the plumb lines and invited them to understand the conservators problem first hand, to consider how the conservators might measure the scope of the problem throughout the cemetery, by identifing the monuments that are at risk, and collecting data to identify the ones that are shifting the most across time. Finally we ask visitors to consider what they might recommend as a conservation plan given a limited budget. What we learned: Parking Day means a town assigns a parking space in the square to anyone who applies. Approved applicants can install their project in an assigned space for a day. The event is coordinated, publicized and promoted by the town. Visitors can circulate past the parking spaces and interact with exhibitors. MathHappens: We provided a walking activity where you go around cones arranged in a polygon (triangle, square, pentagon) and “discover” that regardless of the number of cones – how many sides in a polygon, the sum of the exterior angles is 360. Our cones were appropriate to the setting and we were able to engage interested visitors. By choosing to spend time with us, visitors had a better experience than most students in school where they have to attend math class. We gave out protractors at this event. Austin Toy Museum Grand Opening. What we learned: The Austin Toy Museum is a new museum featuring a collection of action figures, toys and arcade games primarily from the mid 1980s and 1990s. The founders were interested in attracting families and school groups and hope to be a destination for kids of all ages. UTeach intern Michelle Tat spent several hours touring the museum while under construction. After some consideration of the various collections and their potential for math connections, she decided to focus on the Smurf collection. She reviewed several hours of Smurf cartoons and developed a menu of math programming relating to the Smurf world and storylines. MathHappens: For the opening we focused on Papa Smurfs potions and on Jokey Smurf’s gift giving. We were able to relate the potions to a classic problem involving liquids transferred from one container to the other sometimes called the “Milk and Tea” puzzle. Since Jokey Smurf gives gifts which might be flowers, a cake, or a dust bomb we were able to reframe this as a “choice problem. The classic Monty Hall problem involves 3 curtains and fit perfectly with the three gifts. We made demonstration models of the problems out of wood at the MakeATX laser Coop, and had a lot of fun wearing Smurf hats while staffing the opening. What we learned: The Little Free Library is a non profit organization that provides materials to construct a free library for homeowners. The libraries are free and passersby can take or leave books. The organization runs promotions to help engage potential librarians and were interested in a math book donation for Pi Day. What we learned: The Dionysium Show is a quarterly evening entertainment variety program in the style of a club devoted to intellectual topics that takes place in a movie theater that serves food and drink. Challenge was to do meaningful math engaging both individuals and the group who are in a theater sitting in the dark, unable to write notes do calculations or interact in small groups. MathHappens: To create a participatory element, we played the Birthday Game by recording birthdays (day/month) of attendees as they arrived and gave prizes (books) to twins. We also handed out the “coin trick” (a challenge to pass a quarter through a hole in a bit of paper that is the size of a dime) which was a favorite of Lewis Carroll who was known to offer puzzles to dinner companions even in formal settings. What we learned: The Thinkery were expecting as many as 500 participants who would be drinking beer and circulating among offerings from various organizations. Social games were of particular interest to organizers as this was offered as a mixer for young adults. The Birthday Game via name tags encourages participants to look at each other’s tags and offers a fun way to engage with new people. Math topics that offered insights to current events or decision making were of particular interest to organizers. MathHappens: With the success of Dionysium show Birthday Game we decided to play on a larger scale. It was a big success and a lot of fun. Twins bonded, took a photo in the booth adjacent to our table, and formed a kind of community of twins. Each twin received a copy of the book Thinking Physics by Lewis Carroll Epstein, a great example of applied math. At our tables we offered visitors: a Lewis Carroll puzzle paradox 64=65 from the recent Harry Ransom Center exhibit, a model and explanation of gerrymandering, and an opportunity to participate in and a real time data collection of the Monty Hall choice game. Many participants returned to see the accumulated outcome!